24 years after it was first started, a hotel building which once aimed to be the world's tallest tower will finally open its doors in the North Korean capital. The Ryugyong Hotel, a glass tower spanning 105 floors and rising 1,080ft high, will partially open in April 2012 after decades of delays. Reader Howie G. sent me a tip about this story. The opening should coincide with the 100th anniversary of the birth of the nation's founder Kim Il-sung, with celebrations peaking in April. Construction on the hotel, whose name means Capital of Willows, began in 1987. However, construction ground to a halt in 1993, due to lack of funds following the collapse of the Soviet Union, economic mismanagement and natural disasters. Three years ago, North Korea announced plans to resume and complete construction, in partnership with Orascom Group Inc, an Egyptian conglomerate. (They should know a thing or two about construction of pyramids.) The building will have the hotel on 20th to 30th levels as well as restaurant services and business facilities. 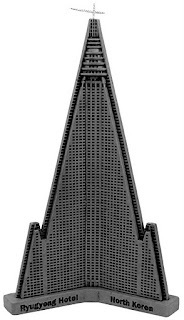 InFocusTech makes a pewter replica of the Ryugyong Hotel that stands a little over 7.5 inches tall and includes a construction crane on top.